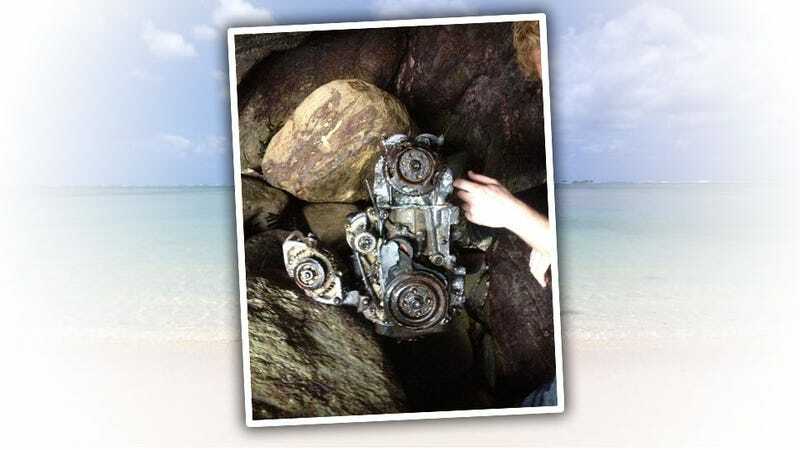 What's This Engine Found Washed Up On The Beach? I’ve found lots of things on beaches — dead jellyfish, syringes, condoms, some seaweed-like stuff that I swear gets you high — but I’ve never found a surprisingly intact inline-four (with gearbox) like beachcomber Sara Clarke found at Whipsiderry, a little seaside hamlet around Cornwall, England. What’s this engine from? Also, ‘Whipsiderry’’ is a hilariously British word. It sounds like what I imagine the Queen says when she almost slips on some Corgi poop. The picture comes from the Newquay Beachcombing Facebook group, which is a loose collective of people who like to find crap on beaches, as far as I can tell. If anyone can ID this engine, it’s the Jalopnik Hive Mind, so let’s see what we can do. To me, it looks like some kind of sub 2L four-banger... maybe a Fiat something? Something common in the UK, I’d guess. Of course, even if we ID it, that doesn’t explain how it ended up lodged in some rocks at a beach. I’m open to hearing theories on that, too. I suspect teenage Kraken vandals. So... what are we looking here?